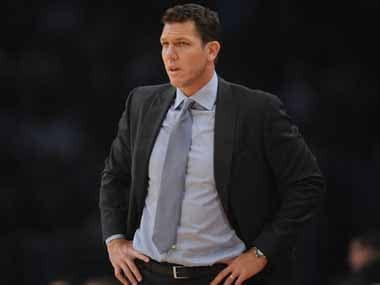 Los Angeles: A little rest did a world of good for the reigning NBA champion Cleveland Cavaliers, who showed spring in their step in a 119-108 victory over the Los Angeles Lakers on Saturday. LeBron James scored 26 points, including 16 in the fourth quarter. Kyrie Irving had 21 points and matched his career high with 12 assists and Kevin Love scored 27 points and pulled down 17 rebounds a night after Cavs coach Tyronn Lue rested the star trio. Irving was back after a week off, having told Lue he had tired legs in last Saturday's victory over the Charlotte Hornets. "It was warranted," Irving said. "How I felt, knowing the importance of what was coming up in the season, I think it was a great group decision in terms of the rest that was needed." The trend of resting star players who aren't injured has sparked debate -- in part as to whether it's fair to fans -- but Lue said Saturday he would consider resting Irving again. 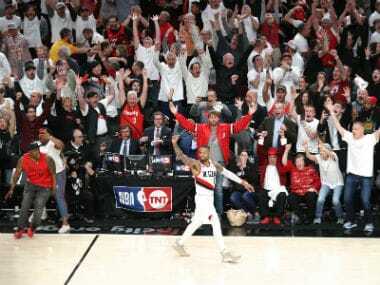 "There will probably come another time where he's going to need a little rest also," Lue said. "Right now, he's feeling good and that's the biggest thing for me." The Lakers, who snapped an eight game losing streak on Friday at Philadelphia, led by as many as eight late in the first quarter and maintained the lead into the second period. But the Cavs had edged ahead 62-59 at halftime and didn't trail after the interval, although the Lakers cut the gap to 108-105 late in the fourth quarter after two three-pointers from Nick Young. 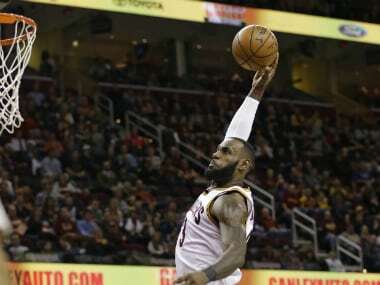 "They hit some tough shots," said James, whose three-pointer with 2:32 remaining stretched the Cavs' lead to 113-105. "It was up to us to get a couple timely stops like we usually do in the fourth quarter and make a couple timely shots like we do -- and we did that." Western Conference powers Golden State improved their league-leading record to 24-4 with an emphatic 135-90 triumph over the Portland Trail Blazers in Oakland, California. Kevin Durant scored 13 of his 34 points in the first quarter as the Warriors jumped to an early lead. Reserve Ian Clark added 23 points, Stephen Curry chipped in 19 and Klay Thompson scored 16 as Draymond Green contributed a double-double of 13 assists and 12 rebounds. The 45-point margin of victory was the Warriors' biggest of the season, surpassing their 149-106 drubbing of the Lakers on November 23. A day after connecting on a record 24 three-pointers in a win at New Orleans, the Houston Rockets rallied to notch their 10th straight victory, 111-109 in overtime over the Minnesota Timberwolves. James Harden scored 10 of his 28 points in the extra period, handing out 13 assists with nine rebounds that left him one shy of a second triple-double in as many nights. Forward Ryan Anderson scored 28 points and Eric Gordon provided his familiar spark off the bench with 20 as the Rockets erased a 13-point fourth-quarter deficit. "We had a pretty off night overall, but we made shots when it counted and stayed with it," Anderson said. Oklahoma City star Russell Westbrook was in familiar territory, notching the 50th triple-double of his career -- and 13th this season -- in the Thunder's 114-101 victory over the Phoenix Suns. Days after Westbrook said he was tired of the talk about his streak of seven straight triple-doubles -- which ended last weekend -- he was at it again, pouring in 26 points with a career-high 22 assists and 11 rebounds. It's just the fifth time since 1983 that a player posted a triple double that included at least 20 points and 20 assists. New York star Carmelo Anthony called the Knicks' game in Denver a "must win" but his 29 points weren't enough for the visitors in a 127-114 loss to the Nuggets. Kenneth Faried had a season-high 25 points and three blocked shots and Emmanuel Mudiay scored 22 for the Nuggets, who had seven players score in double figures.